Put the world of collecting at your fingertips! Stay informed on every aspect of sports collecting with the oldest and most respected publication in the hobby. 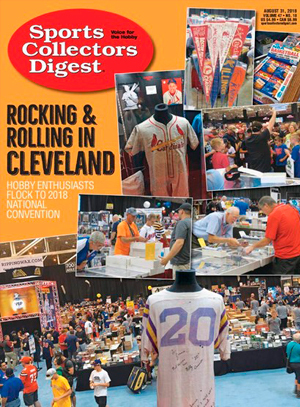 For more than 40 years, Sports Collectors Digest has been THE source for information on everything from trading cards to memorabilia, autographs to game-used bats, sports artwork to 19th century rarities. If you're a serious collector, you can't afford to miss a single issue. Subscribe and SAVE 85% today! Go Digital: Each issue delivered by email right to your inbox! SUBSCRIBERS' AUTOMATIC RENEWAL FEATURE: I understand that I will receive uninterrupted service and delivery of my magazine and that my subscription will be automatically renewed each year at the rate then in effect. I won't be bothered with any renewal notices in the mail; instead, I will receive a clearly marked annual reminder 6 weeks before my credit card is charged. I may cancel at any time during my subscription and receive a refund on any unmailed issues by calling 1-800-829-5561 (U.S.), 1-386-246-3455 (Int'l).